So an apple is unprocessed, and plain apple sauce made with just apples is minimally processed, while a packaged apple dessert with additives added is ultra-processed. Think of it as "transformed food". Also keep in mind that your beneficial gut microbes like unprocessed or minimally processed food - especially those high in fiber. You know - a diet rich in fruits, vegetables, whole grains, seeds, nuts, legumes (beans). 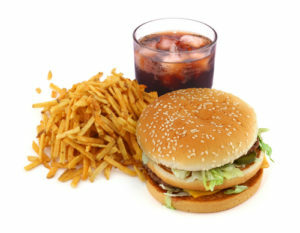 ...continue reading "Ultra-Processed Food and Risk of Cancer"
Not good news. More than half of Americans’ calories come from “ultra-processed foods,” according to a new study published in BMJ Open. Ultra-processed foods were defined as "formulations of several ingredients which, besides salt, sugar, oils and fats, include food substances not used in culinary preparations, in particular, flavours, colours, sweeteners, emulsifiers and other additives used to imitate sensorial qualities of unprocessed or minimally processed foods and their culinary preparations or to disguise undesirable qualities of the final product". Whew....In other words, they're not real foods, but fake or pseudo foods with lots of added stuff that doesn't occur naturally. Examples are instant soups, sodas, many frozen meals, cake mixes, packaged snacks, energy drinks, syrups (excluding maple syrup). Ultra-processed foods account for about 90% or almost all of the added sugars Americans eat. 'Ultra-processed' foods make up more than half of all calories consumed in the US diet, and contribute nearly 90% of all added sugar intake, finds research published in the online journal BMJ Open. Ultra-processed foods are formulations of several ingredients. Besides salt, sugar, oils and fats, they include substances not generally used in cooking, such as flavourings, emulsifiers, and other additives designed to mimic the qualities of 'real foods'. Ultra-processed foods include mass produced soft drinks; sweet or savoury packaged snacks; confectionery and desserts; packaged baked goods; chicken/fish nuggets and other reconstituted meat products; instant noodles and soups. To assess the contribution of ultra-processed foods to the intake of added sugars in the US diet, the researchers drew on dietary data involving more than 9000 people from the 2009-10 National Health and Nutrition Examination Survey (NHANES), an ongoing nationally representative cross sectional survey of US civilians. They looked at the average dietary content of added sugars and the proportion of people who consumed more than 10% of their total energy intake—the maximum recommended limit—from this source. Ultra-processed foods made up over half of total calorie intake (just under 60%) and contributed almost 90% of energy intake from added sugars. Added sugars represented 1 in every 5 calories in the average ultra-processed food product—far higher than the calorie content of added sugars in processed foods and in unprocessed or minimally processed foods and processed culinary ingredients, including table sugar, combined. A strong linear association emerged between the dietary content of ultra-processed foods and the overall dietary intake of added sugars. Furthermore, the proportion of people exceeding the recommended upper limit of 10% of energy from added sugars was far higher when ultra-processed food consumption was high, rising to more than 80% among those who ate the most ultra-processed foods. Notably, only those Americans whose ultra-processed food consumption was within the lowest 20% had an average daily added sugar intake that fell below the maximum recommended limit. Several leading health bodies, including the World Health Organization, the Canadian Heart and Stroke Foundation, the American Heart Association, and the US Dietary Guidelines Advisory Committee have concluded that excess added sugar intake increases the risk not only of weight gain, but also of obesity and diabetes, which are associated with a heightened risk of cardiovascular disease, and tooth decay. Cutting back on the consumption of ultra-processed foods could be an effective way of curbing excessive added sugar intake in the US, conclude the researchers.